The Domestic Relations Court Act of the City of New York, passed by the New York State Legislature in 1933, combined the Family Court and Children's Court into the Domestic Relations Court. With the creation of a new court system, the Children's Court located at 137 East 22nd Street needed additional room. 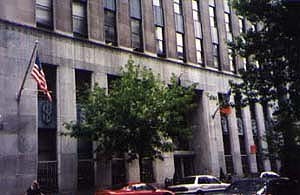 In 1937, New York City commissioned a new building for court and administrative purposes from architect Charles B. Meyers. Meyers worked extensively for New York City, especially during the 1930s, designing the Criminal courts building (with Harvey Wiley Corbett), the Department of Health Building, and several hospitals. The Domestic Relations Court was established so that the problems of children and of families could be treated in a unified manner. This reflects the continuation of an interest in treating problem children and unstable families in a humane manner that had initially led to the establishment of Children's Court in 1902. For the new Domestic Relations Court Building, Meyers designed in the austere stripped-down style often referred to as "Modern Classic." The courthouse has a two-story granite base with limestone above. Windows are arranged in vertical bands with aluminum spandrels and are flanked by vertical strips of stone that allude to classical pilasters. In a manner that is characteristic of public buildings erected during the 1930s, the Domestic Relations Court is embellished with a series of reliefs expressing themes exemplifying the use of the structure. These aluminum reliefs, done by sculptor H.P. Camden, are located in the spandrels, between the first- and second-floor windows. There are eight figured relief panels, most with family groups involved in activities such as reading, gardening, and praying. between each of the figural reliefs are abstract foliate motifs that are identical. Over the entrance, Camden designed a panel with the seal of the Domestic Relations Court. This is set in front of an aluminum grille. Although the building has been converted for use by Baruch College, its exterior is virtually unchanged.